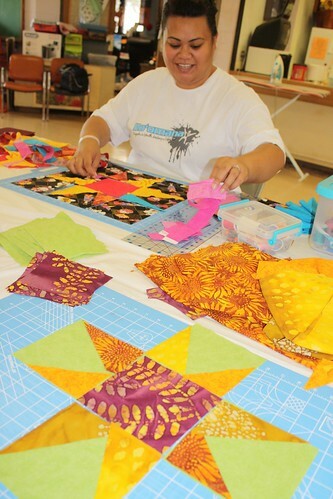 Several times a year, I teach a beginning Patchwork class at my local park. The first class made a sampler quilt; the second a tote bag, pillow cover, and table runner; the third a paper pieced pineapple quilt; and this time, a tote and a baby quilt. My goal with these classes is to give my students some basic patchwork skills that they can expand upon in their own projects, and/or recognize in patterns, and so have the confidence to try the projects that appeal to them. 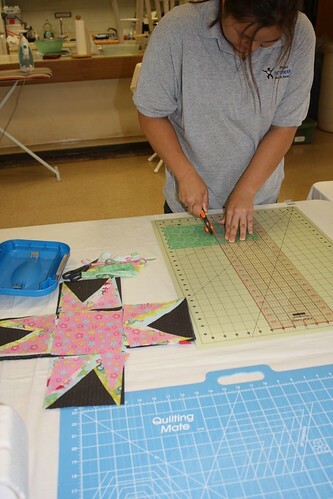 Jill is learning rotary cutting, and making liberated stars. Dez is playing with color. In the foreground is one of Jason’s stars. Darlene is amazed at how effective the flocked backing of a vinyl table cloth is for laying out blocks and transporting them to and from class. And I learn too. With a scrap piece of paper and a little origami skills, a trash bin is always at hand. Kathleen whipped one of these up each day. 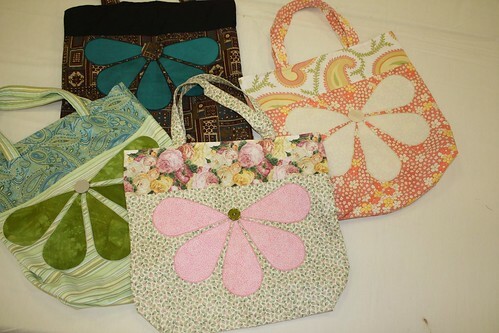 Our first project was a lined tote bag with a fused applique of a naupaka flower. 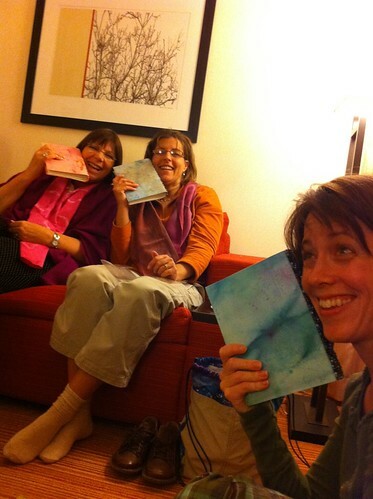 The top one is Kathleen’s, to the right is Jason’s, front and center is Darlene’s, and the left one is my sample. 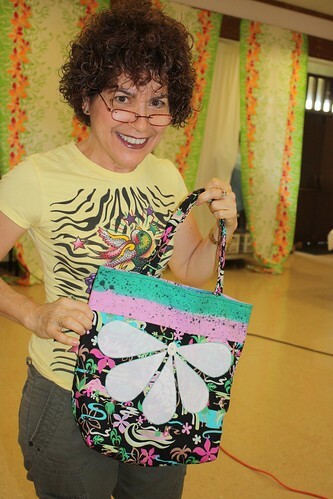 Here’s another Kathleen with her happy Hawai’i print tote. Deb made two totes, one for a friend, and the second with my very own Naupaka and Taro print fabrics from Spoonflower, complete with coconut button! I’m going to have to make one of those too. 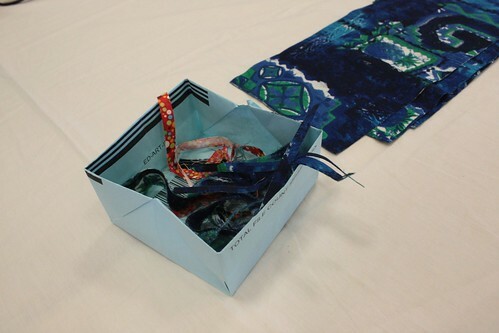 And finally, Katie’s tote made from fabrics she bought in Paris on her summer vacation. Now she’s got a souvenir she can carry with her whenever she wants. Our second project was a Star Baby quilt. Fun, liberated stars, and a not-too-big size. Lynn says this top, with it’s puppy print, is for her dogs, but we all think it’s way too cute! Jill didn’t quite get her’s finished, but it’s well on it’s way. Barbara’s froggy print quilt is going to be extra snuggly since she’s replaced the backing and batting with fleece. We all learned that it’s important to leave a generous amount around the edges as the fleece likes to shift. Darlene was the first finished project. She wowed us with her serpentine quilting in metallic thread! 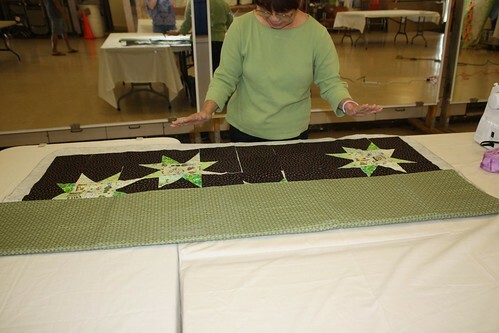 Naomi fussy cut fabric with a Dresden Plate print for the star centers. Kathleen chose an aloha print for her star centers and built her other colors around it. Tying finished the quilt off quickly and now she’s got her very first finished quilt to enjoy. Kathleen T’s brightly saturated quilt looks like colorful fish in tropical waters. She even chose a fishy fabric for her backing. Katie (our third Kathleen) went for a tropical Christmas theme. She tried using a fancy snowflake embroidery on her machine for her quilting. Not convinced it worked so well on this project, she made a pillow from one star block and outlined it with the snowflakes for a much better effect. Note that Katie adapted the piano key border from the tote in a previous class for the border on this quilt. That’s exactly the kind of skills I want to instill in my students. Jason is another of my “advanced” students. 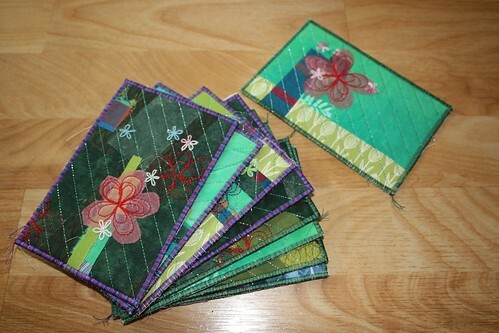 He added a liberated half square triangle border, and a pieced backing. He said he loves this easy and affective star pattern and is planning on making star quilts for his whole family (but not necessarily all this year!). We’re done for now, but everyone is excited to start up a new class on January 23rd. We’ll make the sampler quilt and add some more traditional blocks to our skill library. Last week my kids and I participated in a Fun Day to benefit Juvenile Diabetes Research Foundation. In previous years we’ve joined the official Honolulu Walk at Kapiolani Park. This year, our fearless Team Taylor Kickin’ Diabetes leader organized a Fun Day for family and friends at our local Community Center. and then walked around our park. Since a big part of the group was the Oahu Taekwondo family, a group of kids working towards their Black Belts had to run two miles, timed, as part of their qualification. Oh, these aren’t the blackbelts — they’re a group of guys that like to dress up for charity events. For those not in the know, on this day they were soldiers from the video game Halo. Afterward, we ate a yummy lunch (with adorable logo cupcakes) and were entertained by guitarist, Kamuela, and then a family band who dusted off some oldies. All in all it was a great day, and raised a good amount of money for the cause. Even from our back row seats, it’s obvious that life with Type 1 Diabetes is not easy for Taylor, or her family. Lots of missed days at school, visits to the hospital, and a restricted diet — not to mention all the needles! 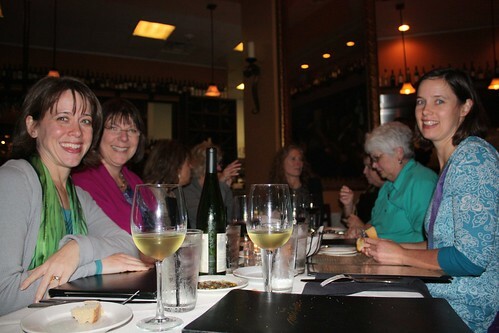 The insulin pump is a great help, but even more can be done and JDRF is leading the way. Thank you Team TKD! I think this is my last Houston post. I have a few more quilts to share that caught my eye. 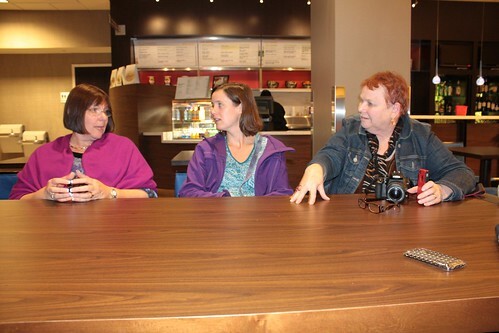 In all though, I think that both this year and last, the best part of the show is meeting and networking with others. I’m not doing any networking that I expect to lead to sales or important projects, but I do think it’s great to put faces to names and to make a more personal connection to people I otherwise know only through email or names on a website. I love volunteering at the SAQA booth for just that reason. Many people whose work I’ve admired, or who are curating shows, or whose names just keep popping up are there and I get to meet them in person. 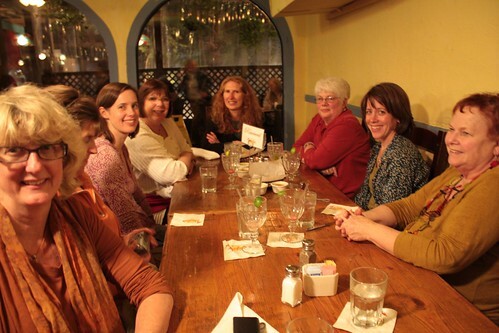 And, of course, this year meeting nine of the Twelves was just fantastic! Skating, by Joyce Seagram and Edna Koepke. I’m not always a fan of The School of Nancy Crow, but this one grabbed me. It’s big and bold too and I gotta love that. I can’t think of a quilt by Diane that I didn’t like. The simplicity and craftsmanship get me every time. Nice line and color. And only the most subtle sheen in the three metallic papers. Part of the Text on Textile exhibit. This one reminds me of one I liked last year by Jean Wells Keenan titled Stone II. I like them both. Quilter’s Village, by various artists. Doll Bed Quilt by Donna Eng. Donna’s in the same quilt guild as I was and loves miniature quilts. This sweet little one is quintessentially her. Pineapple Fantasy, by Nancy Roach. As long as I was admiring Donna’s doll bed quilt, there were several others that caught my eye too. After my Aloha Pineapple quilt, I can’t help but like this teensy one. Flower Fairy Quilt, by Vicky Clontz. Really amazing hand quilting, and I think the simple design and pale colors are rather sublime too. I can be a sucker for a traditional quilt — especially a blue and white one. I think this is a variation of Burgoyne Surrounded. Me and My Shadow (detail) by Gail Stepanek & Rhonda K Beyer. Love the combo of chocolate and bright, but light, colors. First place Innovative Applique. Buttons, beads, sparkle, cuteness, precision, everything we love from Japanese crafting magazines! I particularly liked the tree and the mushrooms (of course). Crown Jewel (detail), by Claudia Clark Myers & Marilyn Badger. The big winners and most popular quilts had lots of sparkle and dense quilting. This was no exception. I was most impressed by the quilting on this in the beige areas. We interrupt the pretty quilts for some shopping and a giveaway! First off, Lark Books is having a giveaway, and one of the books is ours! For a chance to win Twelve by Twelve: The International Art Quilt Challenge, or several other books (the Masters 2 book is chock full of pretty and inspiring artwork) just go to Lark’s blog here, and leave a comment by 9pm EST on November the 18th. While any comment is fine, Lark is particularly curious about your favorite fabrics and what you plan to make with them…which leads nicely into showing off my Houston purchases. My first task was to find wool batting. I am on a quest to find the best one for me. I had mixed results with Quilter’s Dream, but heard rave reviews of Mathilda’s Own. I couldn’t find any of that, but did like what I saw and heard of Hobbs, and picked up an awesome sampler of Pellon battings for my quilting students to fondle (BTW, they loved the feel of the bamboo batting). On my way back from the batting outing, I passed Marcia Derse’s booth. well, pass is wrong since really, I had to stop in and buy. I’ve admired her hand dyed pieces and simple aesthetic for several years and now that her fabrics are available as quality yardage, I’m all in. I’m not the only one either, I think at least four Twelves made purchases as well, and while there, I ran in to Victoria of Bumble Beans and had a bloggy buddy moment. 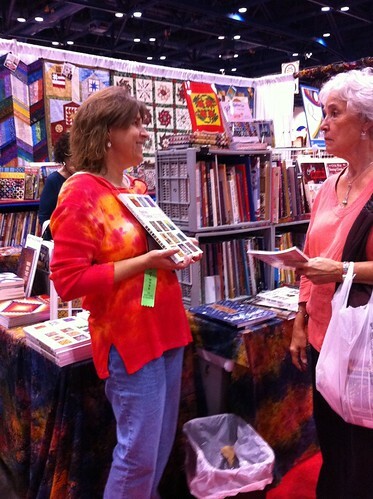 While looking at the World of Beauty quilts, I overheard one quiltmaker mention that she uses Oakshott shot cotton fabrics and that one of the vendors was selling them. “Shot” fabrics use different colored threads for the warp and the weft, resulting in a lovely shimmer depending on how the light hits them. I had a few Oakshott samples from Europe and loved, loved, loved them, so off I was in a flash to go find the vendor. I hit the jackpot and refilled my stash! And look what I happened upon returning from the booth with the shot cottons. I couldn’t possibly pass up the radially dyed fabrics I’ve been admiring in so many Hawaiian quilts. Now I just need to figure out exactly what I’ll make with them — traditional Hawaiian, or something closer to my usual work? Finally, I bought some cool jewelry. It’s made similarly to polymer clay milifiori work, but with a variety of fibers. I’m looking forward to wearing these. I’m always on the lookout for quilts and other fiber art in which the figure is treated well. That’s not to say that I want to see photo realism. In fact, I think those are the ones that most often fall short. What I like is the figure rendered well if realistic, and intentionally if abstracted or naïve. 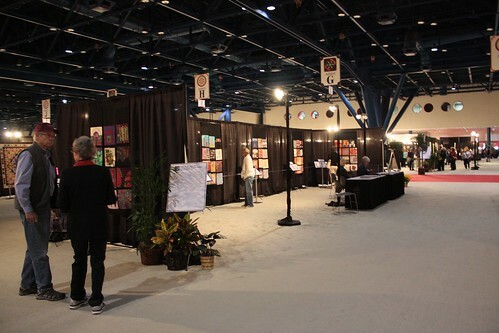 I was pleasantly surprised by many I saw in Houston that I liked this year. Organic is Good For You! by Bodil Gardner. From the Good For You Exhibit. I love Bodil’s work — so much character and freedom! Another quilt by Bodil Gardner. I forgot to get the name of it. I just love her charming ladies. Along with Bodil Gardner, Pam Allen is one of my perennial favorites. She uses primitive and whimsical forms in a wonderfully intentional way that I love. Another Pam who renders the figure in a very intentional, and amusing, way. Population Explosion (detail) by Laura Fogg. I took this detail photo for my friend Natalya who has some figures from her life drawing class which she has done on fabric and would like to incorporate into her textile work. I really like the way the stitched details overlap and blend the pieced areas, and compliment the gestural paintings. Part of the Text on Textile exhibit. Text AND figures — potential to go so wrong, but this one went pretty right. Honorable Mention. I love Mary Pal’s way with cheesecloth. She knows light light and form, and is so unique in the quilt show world. Here’s the usual posterized method of rendering figures in cloth. I thought this one did a good job and made no apologies for being made of fabric (love the obvious florals and checks). Self Portrait, by Joan Sowada. I thought this one also did a good job and made no apologies for being made of fabric, especially where the plaid background interacts with the figures. Dixie Dingo Dreaming by Susan Carlson. Figures don’t need to be human either. 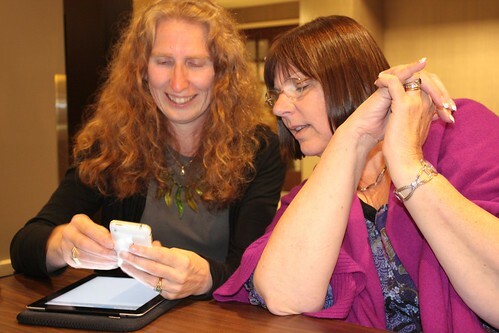 Susan Carlson’s work inspired me years ago, and this one just renewed that spark. She does such a wonderful job of rendering form realistically, yet celebrating fabric as well. Next up, a small collection of photos that didn’t fit neatly into the plant, Hawaiian, or human categories. 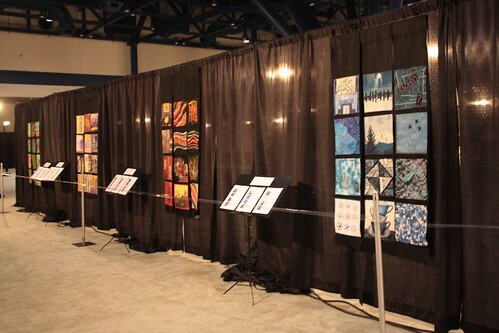 I was going to write a bit about my time volunteering at the SAQA exhibit and what the organization has to offer art quilters at various places in their careers or craft. But, I’ve already forgotten what my big point was. 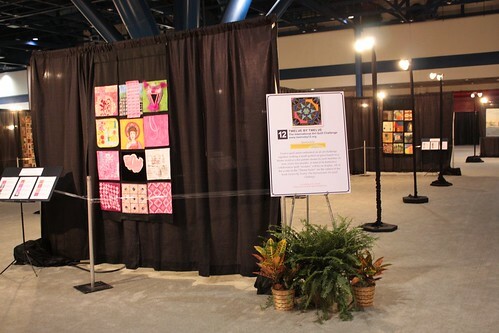 Oh well, that means I can move on to the part most people are interested in: the quilts! I did not take nearly as many photos this year as least, nor did I make much of an effort to see everything on display. I was having too much fun hanging out in the Twelve by Twelve exhibit! 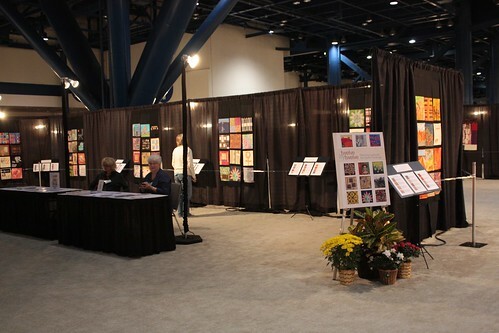 My main impression, especially with the World of Beauty quilts (the main section, eligible for prizes and awards) was that there was a LOT of sparkle. Beads, crystals, metallic thread, Angelina fibers, iridescent paint, the more bling the better. Beyond the bling, I found looking at my photos, that I was attracted to a lot of plant-related quilts. Lemon Grass, by Cynthia Vogt. Ahhh, the simplicity. I wish I could think of things like this. I liked this one even before I saw my favorite Kaffe Fasset print in it! Big! Big Fruit, big color, big patterns. I like it! An Autumn Breeze, by Akiko Kawata. Another of the very graphic quilts I am attracted to. Loved the color palette and graphic quality of this (similar to Autumn Breeze above) and was surprised that it was made by the normally bright and geometric Carol Taylor. Good For You Exhibit. Big, graphic, and zoomed in! First Snow, by Lauren Strach. Nice collage of discharged leaf patterns, but then made more special by all the hand and machine stitching. Eat Your Vegetables by (?!). I am so sorry that I neglected to get the name of the artist of this piece. Good For You Exhibit. a combo of silk(?) painting, and bead and button embellishment. It’s kinda like the love child of of Susan Shie’s and Pamela Allen’s work — two of my favorites. Another glittery one. It grew on me the more I looked at it. I like the whimsey and wackiness. Last year I was drawn to the Hawaiian quilts, and this year the pull was stronger. In the meantime, I’ve also admired the work of Meg Maeda and her students, especially their use of radially dyed fabric. 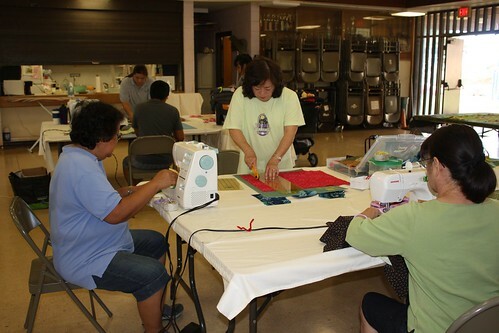 Although it is so amazingly different than either my art quilts or the bed quilts I usually make, Hawaiian quilting is taking it’s hold on me. Who knew it was Borg-like? Hawaiian Quilt, by Mi-Jung Kim. The Hawaiian quilt bug is infecting me. I was drawn to every one I saw — especially those using radially dyed fabric. I live the way the colors can interact where the transitions on the foreground fabric align with the transitions on the background fabric. This is not the most subtle fabric combination (see Meg’s work for that), but the idea is there and the craftsmanship is fantastic. Halemaumau (detail), by Takashi Kusaka. No radially dyed fabric here, but I liked the particularly lush border on this one, and absolutely “get” the reference to the ferns and glowing lava around the Halemaumau crater at the top of Kilauea. Lei Lani (detail), by Mineko Momose. Another Hawaiian quilt with radially dyed fabrics. I’m hooked. 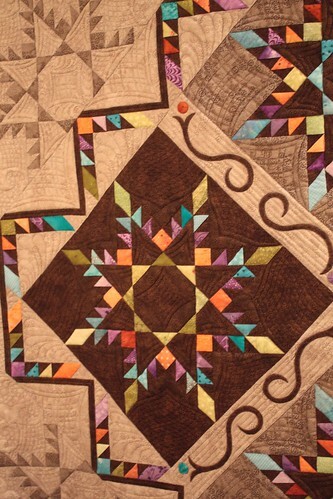 Small radials form the hawaiian applique on separate blocks — yet another application for it. Feathers Aglow, by Judith Thompson. I was drawn to this one because I thought, from afar, that it might fit into the Hawaiian-ish with radially dyed fabric category I’ve been attracted to. Upon closer look, it was carefully chosen and placed commercial fabrics, but I still love the clean, graphic, quality of this. Next up will be quilts with figures — a pet peeve of mine. I was pleasantly surprised to see quite a few that I thought were outstanding.